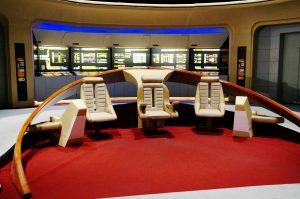 The bridge of a starship is where a lot of the major action takes place. There are many positions which need filling on the bridge. Control (Conn – Pilot), Navigation, Operations Officer (Ops), Tactical (weapons), 4 Science, 2 Engineering, and 3 Communication posts. These positions are assigned by the Heads of the Departments. Bridge: Bridge is a rather small department, but is critical to the operation of the vessel. The Bridge is the platform from which the vessel is commanded, it is where most of the action happen. Main controls and the captain chair are located here, making the Bridge the most secured area of the ship, accessible only to a few with the right responsibility. The Executive Officer (XO) is second-in-command after the captain As head of the Bridge Department, he/she coordinates the Bridge crew and oversees operation of the Bridge, ensure smooth flight operation whether in combat or navigation. The Conn is the main controller of the helm. While long distance travel are usually handle by the autopilot AI, an experienced pilot is crucial for combat maneuver, going in and out of FTL travel as well as docking / landing and taking off. Candidates for the Conn seat usually requires at least 4,000 hours of logged flight time in order to even be considered. The Chief Navigator’s (CN) primary responsibility is to be aware of ship position at all times. Responsibilities include planning the journey, advising the Captain or CO of estimated timing to destinations while en route, and ensuring hazards are avoided. The navigator is in charge of maintaining the aircraft or ship’s star charts, planetary maps, and navigational equipment. The Communication Officers operate the PA system (for internal communication) as well as broadcasting system (for external communication). They also maintain contact with any crew members going on off-site missions. The ability to speak multiple languages is highly recommended for this position.